Yes, Rep Himes you are CORRECT. Congress has done nothing to stop gun violence because there is no law, nothing anyone can do to stop a monster from killing people. Any honest Congressman and political pundits will admit, as even gun control proponent Mark Kelly(fmr Rep Gabby Giffords husband), there are no laws that can stop mass killings. Gun control always comes front and center after some monster kills the innocent, where facts about said individual are left out. Most of the time killers are mentally unhinged, had a history of violence, known by law enforcement to be troublemakers etc. 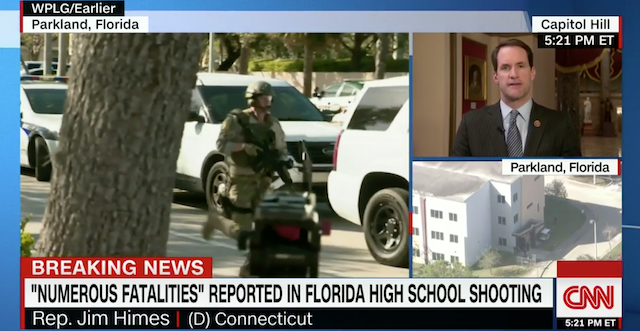 So yes Jim Himes is 100% correct to say “There will be a moment of silence, people will wish everybody thoughts and prayers … and then the Congress of the United States will do absolutely nothing”. The solution Himes and ALL democrats really want is to DISARM the people, BUT you only end up disarming law-abiding citizens! Criminals, evil doers and terrorists carry on business as usual. For the record this monster who shot up Stoneman Douglas High School was looking up how to build a bomb. Take all the guns away today and I guarantee tomorrow monsters will be using bombs or cars and trucks like they have been doing. In the short-term here’s what could’ve been done. The school who KNEW the killer was a problem should’ve notified police and then the blame is on them. Who let him back in school? Let’s blame that person and hold them accountable. The gun is not the problem it’s the individual as it is every single time. More gun control will lead to higher body counts, bank on it.